Last week, Elijah, granny, Chichi, my sisters and I went to town to have a family lunch at KFC. Hihi! Afterwards, we went to Tiongsan supermarket (cheap counterpart of SM here in Baguio) to buy foods. 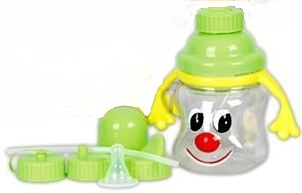 I bought Elijah his very first 5-in-1 feeding bottle. This is exactly what it looks like. Haha! No. Just turn it to color blue. 😀 He loves it very much that he doesn’t want me to touch it or he will scream really loud.